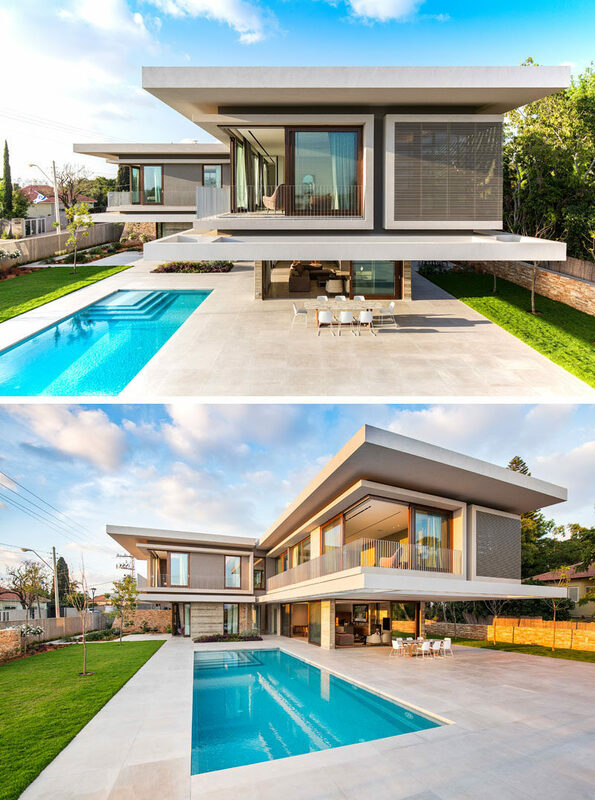 Metropole Architects have recently completed a new house in the suburbs of Tel Aviv, Israel. At the front of the house, there’s a stone driveway that leads to a large gate and visitor entrance, that partially hides the view of the house. Inside the gates, the driveway opens up to a parking area with carport on the left and visitor parking on the right. 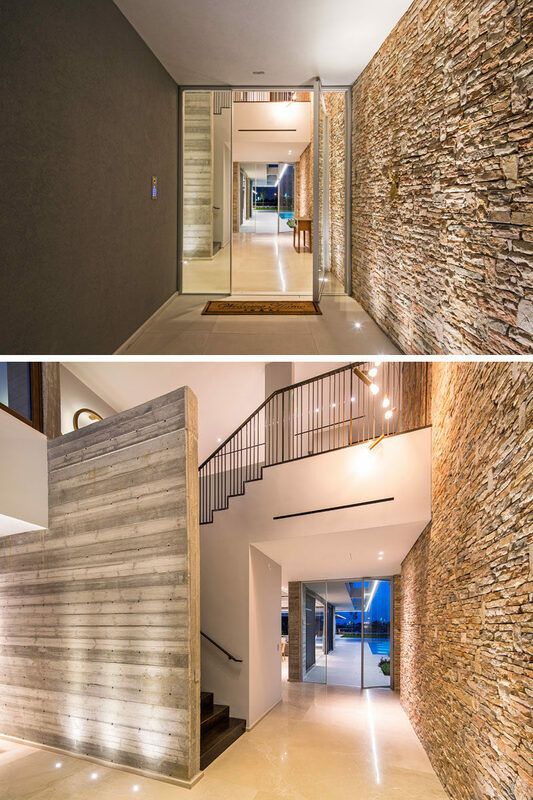 The stone that is featured in the parking area and on the exterior of the house guides you through to the front door and continues into the entrance hallway. 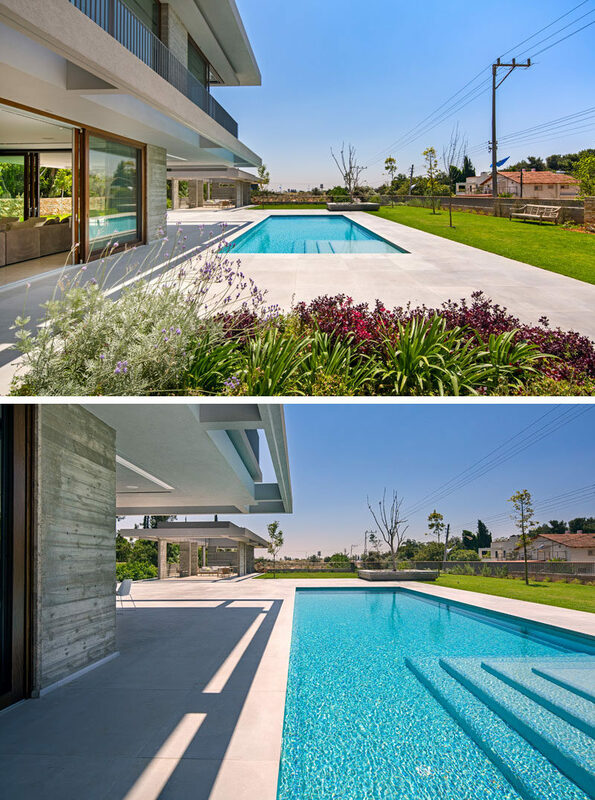 Walking through the hallway from the front door to the backyard, you are greeted by an outdoor patio, and as the house sits on a 650 foot (200m) rectangular lot, there’s also plenty of room for a large swimming pool, grassy backyard and a gazebo. Here’s a closer look at the freestanding gazebo that has plenty of room for an outdoor lounge. The roof of the gazebo provides partial shade for those sitting underneath it. For night time entertaining, the gazebo can be lit up. Next to the gazebo there’s a large patio area with an outdoor dining table. 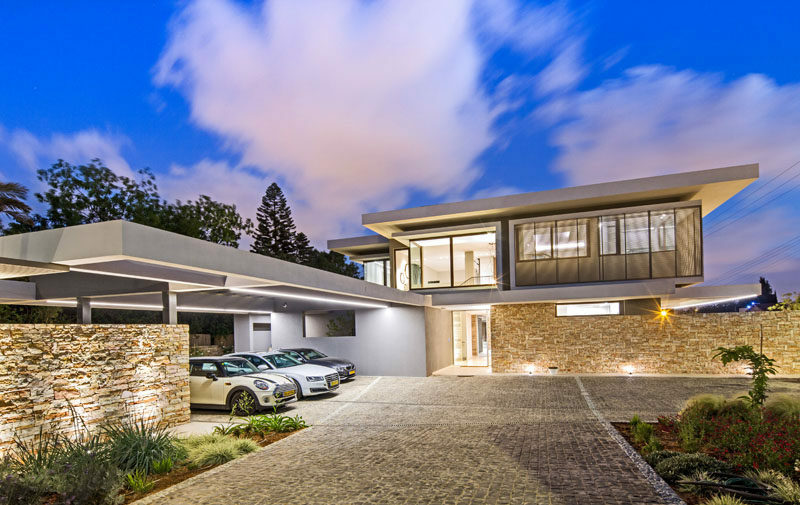 It sits underneath a section of the house that’s cantilevered out to provide shade and add a dramatic touch to the design of the house. Inside the home, the living room shares the space with the dining room and kitchen. 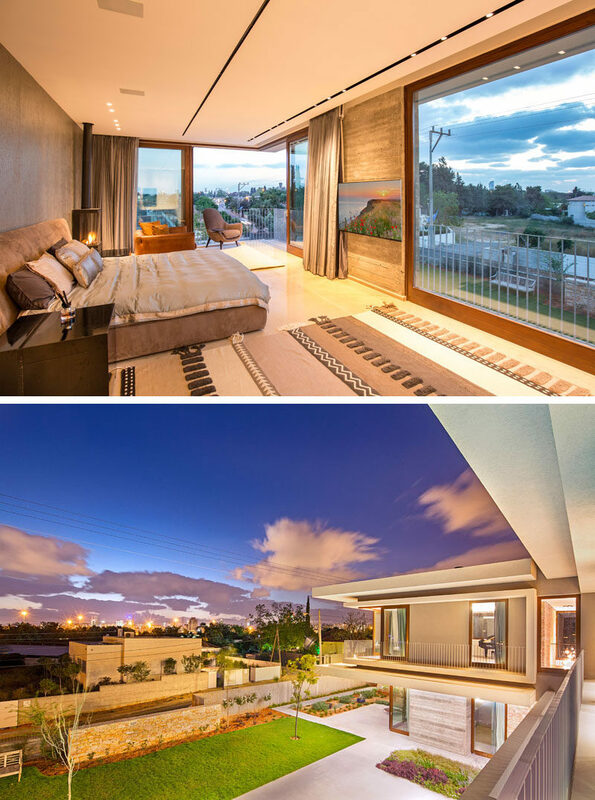 To allow the breeze from the Mediterranean Sea to filter into the house, there are plenty of wood framed sliding glass doors that can be opened. A void in the ceiling with circular pendant lights helps to anchor the dining table in the open plan room. Behind the dining area is the kitchen with a large grey island with a wood bar for sitting at. Wood cabinets line the wall and a large sliding window looks out onto the garden. 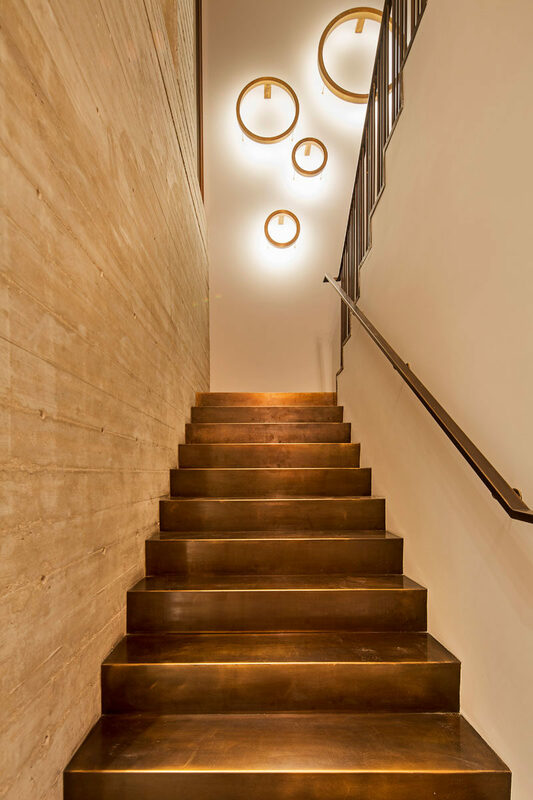 A staircase with bronze stairs and a concrete wall leads you up to the second floor of the home. Upstairs, the master bedroom has a large picture window as well as sliding doors that meet at the corner. The wood framed glass doors can be opened to provide access to a balcony and allow for the breeze to flow into the room. 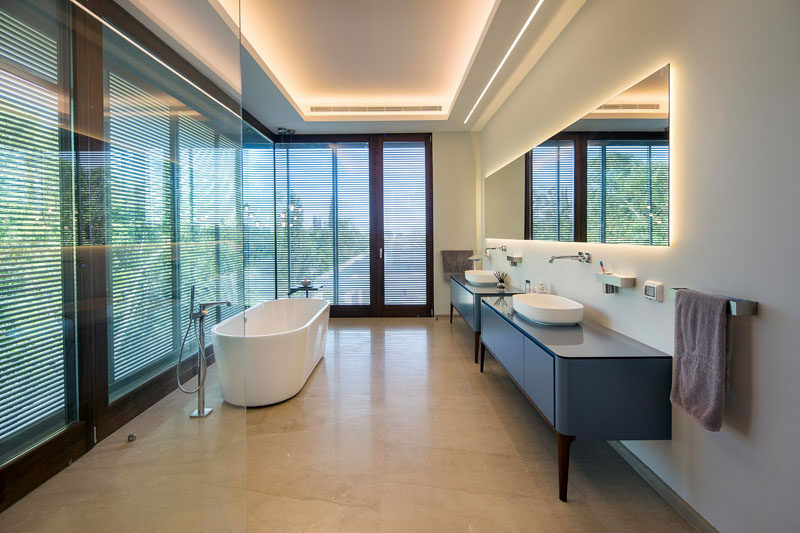 In the master bathroom, lighting is hidden from view in the ceiling and behind the large rectangular mirror. Double vanities provide plenty of space and a white freestanding bathtub sits next to floor-to-ceiling windows with privacy screens.